Why Tiger Airways Re-brands to Tigerair? For those who doesn't know yet, Singapore-based budget carrier Tiger Airways is now TigerAir. The new identity of the leading airline company goes live this month of July. So what's new? Re-branding will be useless unless you change the way you look. 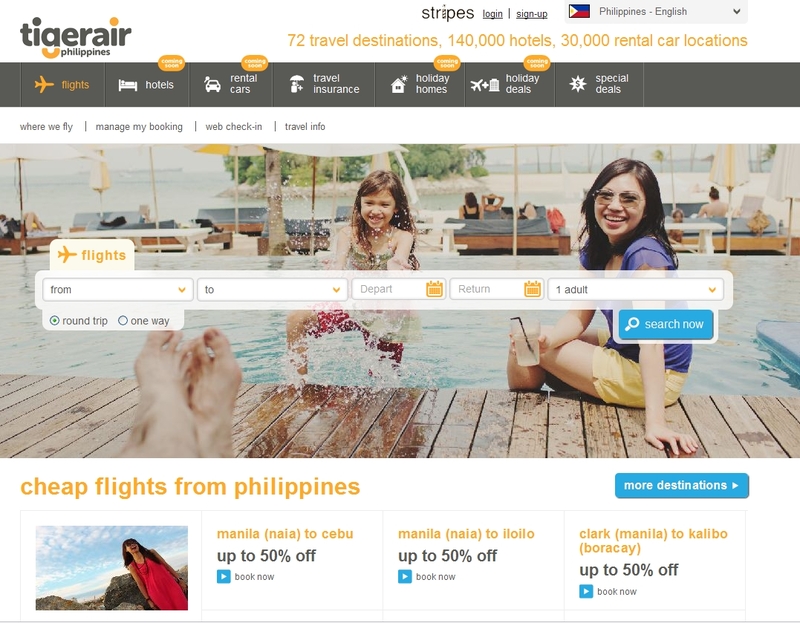 TigerAir did that by revamping their website. Though the Tigerish motif is still there, a combination of orange and dark grey hues, the redesigned website looks more neat with more white spaces than before. I personally appreciate how they show their deals now. Before, it was being shown in flash slides. Now, all the deals were in huge tiles. I also like that the booking section was enlarged and placed at the center of page. Overall, the website is cleaner and more user friendly. The mobile app was also redesigned. The icon was changed to reflect their new identity and the user interface was simplified as well. The change in mobile app though was not as drastic as that of their website. From a ferocious Tiger to a simple-font logo. Tiger Air explained how the logo was conceptualized. The rounded fonts depict friendliness while the two dots, the first in grey and the second in orange, symbolizes Tigerair's role in connecting our customers from one point to another. The different colored dots also depict a friendly wink. The orange semi-circle acts as a subtle reference to a tiger's tail, as well as a smile, representative of the passion and commitment in everything we do. TigerAir said that the re-brand represents their belief that travel should be about great experiences and memories. TigerAir wants to contribute to that by offering affordable air fares that will give more people the opportunity to go to places where they can relax, enjoy and connect to people in Asia Pacific. What's Coming For Tiger Air? Part of their re-branding is their initiative to improve customer experience. Their goal is to make travel as stress free and easy as possible for their passengers. Below are just some of the upcoming features and services that will enable TigerAir to do just that. Well, I am personally glad that TigerAir is trying to innovate. Their entry to Philippine market by acquiring SEAIR was a move that will stimulate competition among the local low-cost airline operators. Competition, when properly managed and regulated will spur industry-wide innovation. The ultimate beneficiaries are the customers. PISO FARE Promo Sends Cebu Pacific Website Down!